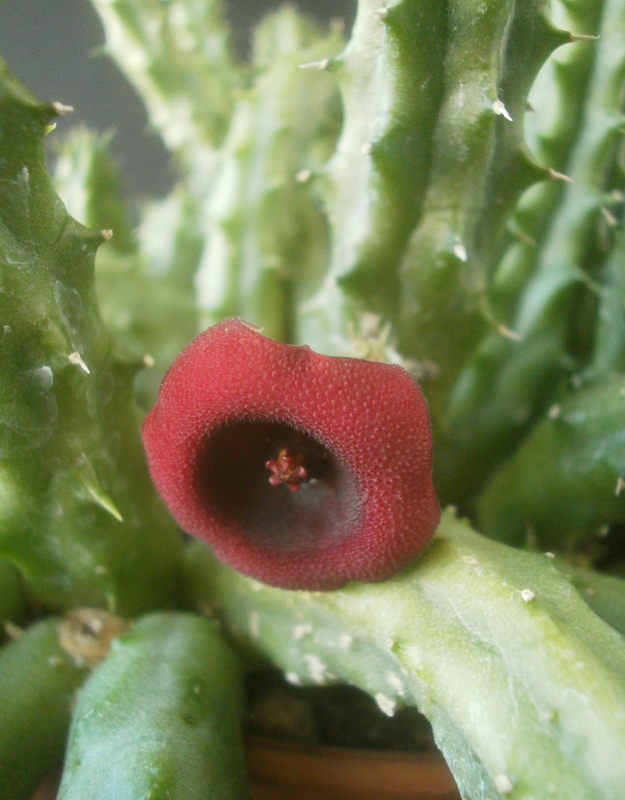 Stapeliads1 are just the best plants. 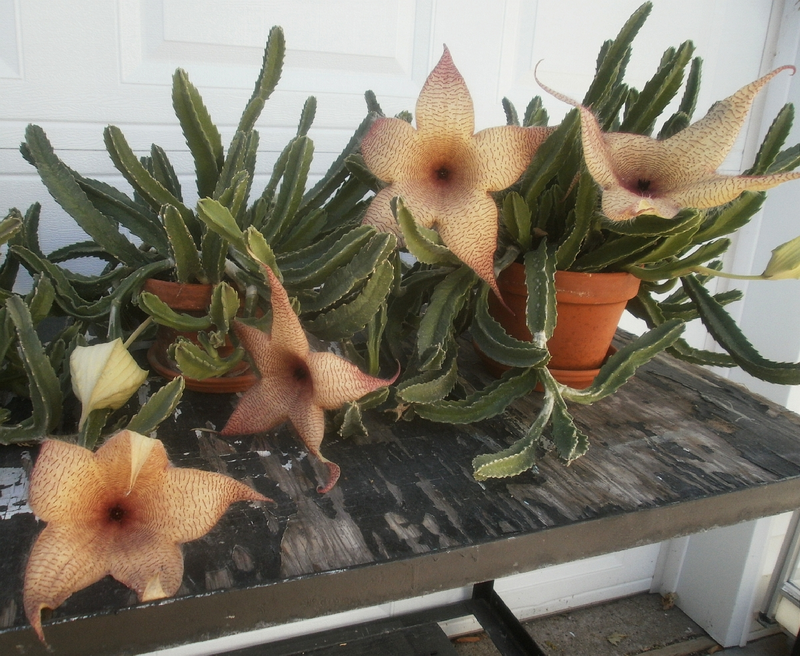 Or, well, they fall just short of being the best plants, because they're difficult to grow from seed, and they're even more difficult to hybridize. But they're so weird, and so easy to grow, and, well, I was prepared to say "beautiful" but how about I just say "weird" again -- that you are almost certainly not growing as many of them as you should be. 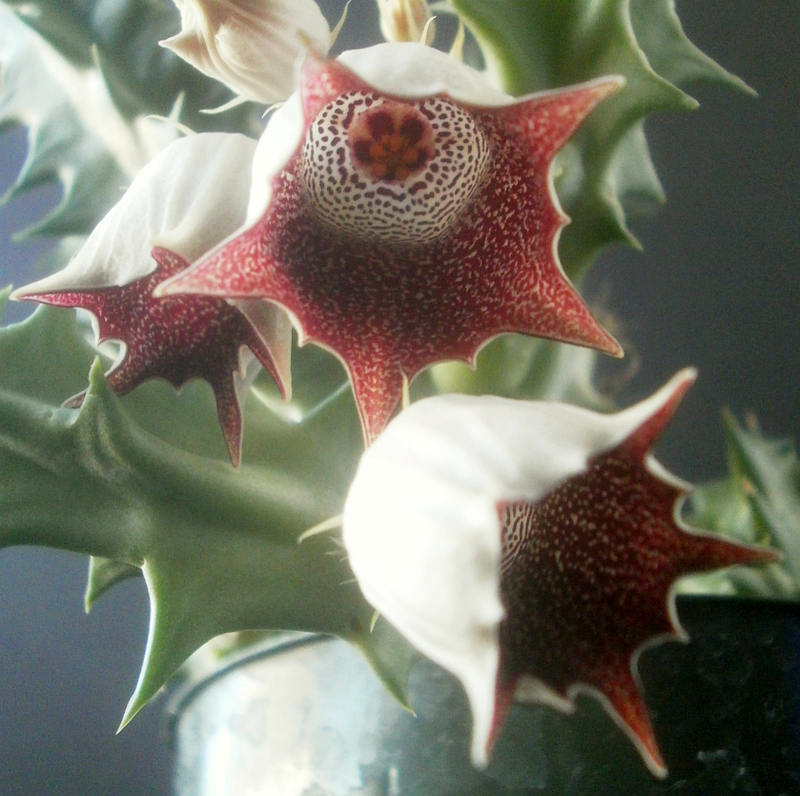 The two biggest surprises this year were Huernia zebrina and Stapelia variegata. Both have bloomed pretty prolifically for me when I've had them outside for the summer, but I never thought they could get enough light in the house to bloom spontaneously. I mean, I only got one bloom apiece, but still. Normally, stapeliad blooms have five-fold symmetry; I don't know what led the plant to produce a bloom with only four of everything. I had a clue that the Stapelia variegata was blooming, but didn't realize it was a clue until too late: Sheba had started doing a lot of pointed sniffing in that part of the living room, which I'd noticed but not given a lot of thought to: it's not that unusual for her to sniff intensely around something for no obvious reason. I found the bloom when I went to water the plants in the living room. A single S. variegata bloom like this isn't particularly unpleasant, but when we had three flowers at once, over the kitchen sink, I was asked, kindly but firmly, to put the plant somewhere else. All five stapeliads are pretty easy to grow. H. schneideriana is one of the easiest plants I have; H. oculata hasn't been here as long as the others, but has been easy so far. I have trouble getting enough light to S. variegata, which results in weak, etiolated new growth, which is sort of a problem. S. gigantea complains about being overwatered occasionally. H. zebrina is the problem child of the group, if any: the joints where new branches emerge tend to be weak, and are easily pulled apart. Often this happens without the stem noticeably changing position or location, so I usually don't notice that anything has happened until a stem starts turning yellow. Though this also makes it one of the easier ones to propagate, as I don't even need to intend to take a cutting a lot of the time: cuttings just happen. 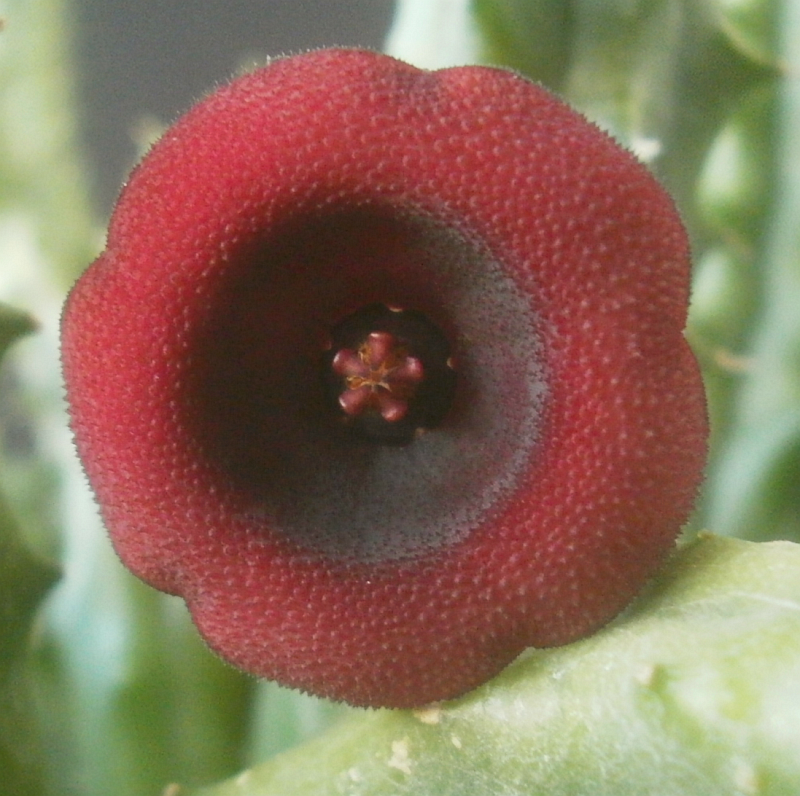 1 The most commonly grown stapeliads are from the genera Stapelia, Huernia, and Orbea, and a few others are cultivated occasionally, or by specialists, like Caralluma, Edithcolea (which has amazing flowers), Whitesloanea, and Hoodia. 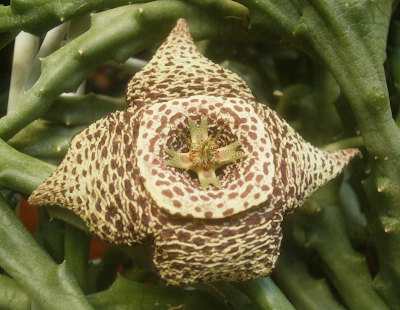 The Stapeliae are a "tribe" within the subfamily Asclepiadoideae, in the family Apocynaceae. This makes them sort of close relatives to Ceropegia, Dischidia, and Hoya, and somewhat more distant relations to Nerium, Plumeria, Stephanotis, and Allamanda. Have you ever gotten their sap on you? I'm apparently super allergic/reactive. I still keep them, but I'm very wary about moving them around now. I'm pretty sure I have; there's an old post somewhere on the blog where I talk about being pretty sure that I accidentally tasted some. 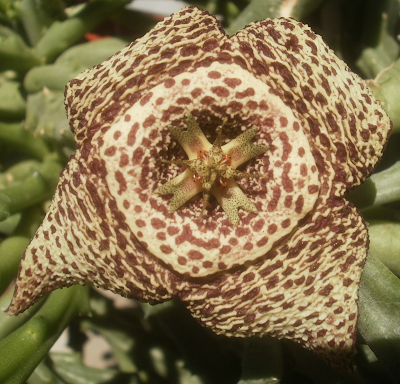 Stapeliad sap has never been a problem for me, but I do a little bit to a few plants' sap -- Ficus benjamina and some Dieffenbachias make me itchy -- so I get where you're coming from. Wow, I so do not want to see what tasting it does to me! I'll have to see if I can find that anecdote in your archives. The reactiveness is primarily a problem due to what you said at the end about their happiness to just fragment into pieces, but with an abundance of caution and just not touching their pots if at all possible it's manageable. I still like them more than glochid and other easily-detachable-spined plants, which I just flat out refuse to own at this point. 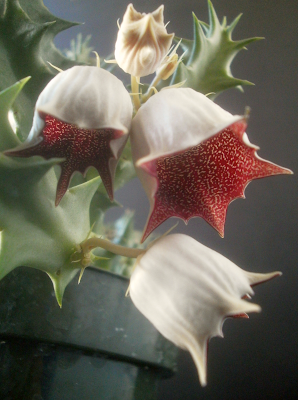 Ceropegia belongs to the same subtribe as the stapeliads, the Stapeliinae. Stephanotis, Hoya and Dischidia are all in the subtribe Marsdenieae of the asclepiads, so Stephanotis is much closer than the old apocynaceae Nerium. Plumiera and Allamanda. It is easy to forget that Stephanotis is an asclepiad as the distinctive bits of the flower are buried at the bottom of the tube and it looks very like apocynaceae like star jasmine, Trachelospermum. Although weird certainly applies, I can't help thinking how beautiful they are and what a great job you did on the pictures. Thank you for sharing! 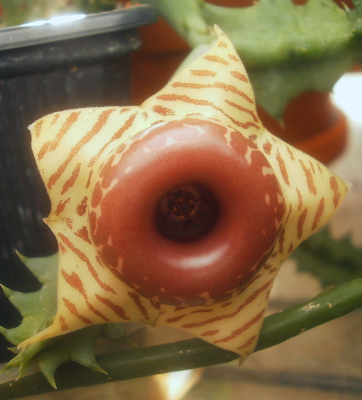 If you ever get the chance, try to get Huernia keniensis, which has fabulous dark maroon (near black) flowers; and Huernia kennedyana which has cute chubby near spherical grey stems and gold and maroon flowers with a papillose texture like a shag pile carpet on the petals - very 1970s! Both of these are fairly easy to grow - about the same conditions as Huernia schneideriana will work, and neither are huge.